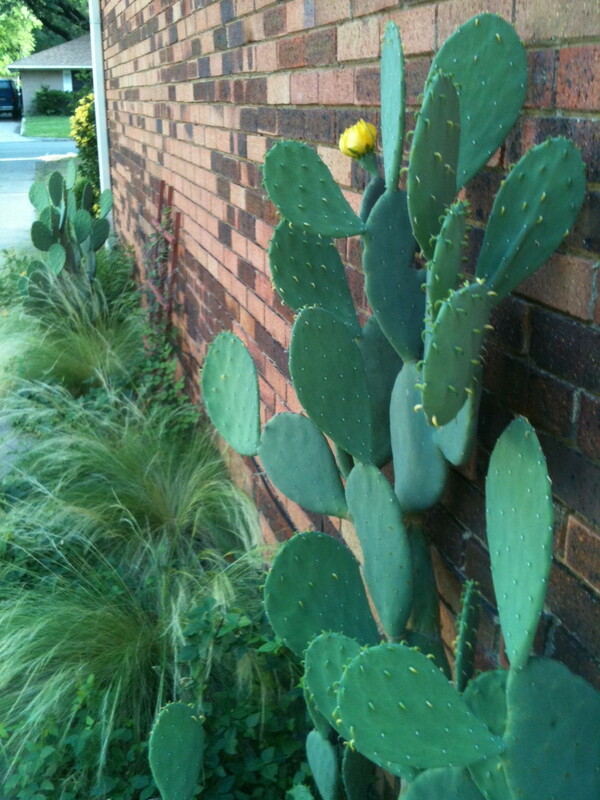 John and I have marveled lately at the size of the cacti blooming on the side of our house. It’s a west-facing strip of dirt that gets a ton of direct sun, not much attention from us, and the additional heat off the brick of the house. But, the cacti are obviously very happy and thrive in that environment. It makes me think about how we too, as people, are happiest and thrive in the places, jobs and relationships where our natural-born temperaments belong. Not many people know that I like to mow the grass. (now you know) The simple act of walking back and forth lost in my own thoughts while smelling fresh-cut grass appeals to me. It does help that I don’t have allergies either. Many years ago, as I was preparing to host a wedding in our back yard, I thought, how cool would the lawn look with a pattern mowed into it? I have no idea how they do the patterns for baseball fields, but it was the look I wanted. Maybe a checker board pattern…yes, that was it! It just took a little thinking and then I just did it. When the Ducky Bob guys showed up with my chairs and tables they stared at my back yard and asked me, “who mowed your lawn?” That would be me I said. They looked at me and then at the yard and shook their heads. I suspected approval, but I really couldn’t tell, it might have been disbelief. Many times over the next few years I mowed the front yard with a checker board pattern. When people drove by while I was outside I could see their heads whip around to stare. Sometimes they stopped and backed up to get a better look. The greatest compliment was the neighbor who figured out my madness and clipped his lawn the same way. That was many years ago and I don’t mow the lawn with a push-mower much anymore….but I’m still creating and visualizing patterns and designs in my mind. Sometimes what we think we know about somebody is only a fraction of who they are on the inside. When asked what I do for a living, for the last 23 years I’ve said, “print rep or salesperson,” but today, after brain-storming with a co-worker, I’ve decided to give myself a new title. I am a creative person at heart…I love to write, to dance, and to create things. So, from now on, my title shall be Creative Print Specialist, or CMYK CPS for short. As a Creative Print Specialist my job duties won’t change, I won’t get a bonus or a raise, but after 31 years in the printing industry…I think I’ve earned that title. I went shoe shopping the other day and tried on about three dozen shoes before I found the combination of comfort, height and fit I was looking for. Every woman knows that the height of their shoe must reflect their own height, what they’re wearing the shoes with and when they’ll wear the shoes. Comfort is a requirement for some women, but obviously not for all. I’ve seen women squish their toes into pointy little shoes. I go for comfort since I’m on my feet a lot during the day. Fit is a must too. I tried on a couple of pairs where the height and comfort were perfect but my heel kept slipping out as I walked. That’s not good. One of the first pairs I tried on was one of the two pairs I bought on that shopping trip. It didn’t occur to me at the time why they were so appealing. Besides height, fit and comfort, it was the designer’s position of the buckle and the strap. Something very simple. The shoes I choose had the buckle more forward on my foot. The others had me contorting uncomfortably in the shoe store trying to get the strap through the buckle part. It only occurred to me the next morning when I was strapping on my new shoes. They were easy to buckle. It was something so very simple, but so very important…less irritation in my morning. Yay. So yes, as usual, that got me to thinking about what I do for a living. Clients are fairly typical in their desire for the combination of price, quality and turnaround from their print providers. But what about the simple things that might make us easier to work with. This is worth thinking about. Thank you Michelle for inspiring me this morning! Nothing in printing is more challenging than specifying paper. In an earlier blog, I likened the paper options we have to the myriad of wall paper options. There are so many paper choices from coated papers offered in many finishes, such as gloss, dull, silk and matte. Then there are the uncoated paper options, meaning they do not have a finish. Then we must consider the paper weights, 65lb, 80lb 100lb, but is that cover, book or a text weight? You have Mills that manufacture coated sheets in many grades of paper, grading usually refers to the brightness, opacity and quality of the coating. I know this is boring, so I’ll get to the point. Designers typically will take great care in determining what paper they want. If there’s a lot of vibrant color they might choose a coated paper because of the superior ink hold out. There is dot gain on uncoated papers and if you’re not working with a quality managed print shop you might not like the way your photos turn out. But then, sometimes there’s the end client who will just roll their eyes and say Finch or Sterling ~ I don’t care which bird you use. You won’t get any arguments from me…I love my smart phone. It is clever, handy and useful. But, there are some things it can not do. For Instance: If you are running late to a press okay, please don’t ask me to take a picture of the press sheet so you can review it while driving. Then, don’t ask me to take a picture of the backside of the sheet so you can see if the inks match up front to back. This makes Larry, my pressman, begin to ask me questions I don’t want to answer. Irene worked at I Can’t Believe It’s Yogurt when I first called on her about ICBY’s printing needs. She was friendly, articulate and didn’t have a lick of printing I could help her with. She had small run work and I only had big 40″ presses. Rats. We kept in contact, because she recognized the value of maintaining relationships with multiple vendors. We also enjoyed our chats, and, you just never know where people will end up. Then, there’s that possibility that a small company might morph into a bigger company. Well, it was more than a year later when Irene landed a new job. In her new job she needed lots of long run work. Thankfully, she remembered me because I had kept in contact with her during the times when she was a small print buyer. Now she was a big print buyer! That was more than 20 years ago and Irene moved away many years ago. I will always remember the opportunity she gave to me. It reminds me that the time a sales person invests in people is never wasted. Even if it means spending a lot of time educating a new person in our industry or servicing a smaller company. You just never know where people will end up.